“Gordon, 29, who lives in Munich, knows everything there is to know about the dark history of the horrific Dachau concentration camp. Who better? I think maybe someone who knows about the real history of the Dachau concentration camp would be better. The visitors probably already know the “dark history of the horrific Dachau concentration camp.” What the visitors need is an unbiased tour guide with a Neutral Point of View (NPV) and a knowledge of history. Some time ago, I read another visitor’s blog about her trip to Dachau. She didn’t identify her tour guide by name, but she did identify him by his accent; how many tour guides with an “Irish accent” could there be at Dachau? I’m guessing that there is only one: Gordon Hogan. The guide spoke of how they cleverly pumped warm air into the room, waited for the poisonous capsule to change to cyanide and then 20 minute for the people to die. Then they moved the bodies into the next room and removed the gold fillings. Finally onto the ovens. 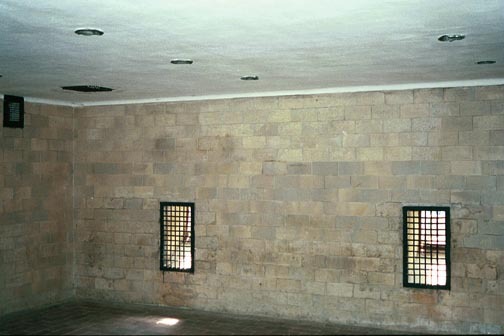 The photo above shows the west wall of the Dachau gas chamber; notice the square vent in the corner near the floor. This appears to be a heating vent to warm what looks like a shower room. A portable sign in the corner informed visitors in 2001 that this room was never used as a gas chamber or never put into operation as a gas chamber; the sign was removed in 2003. 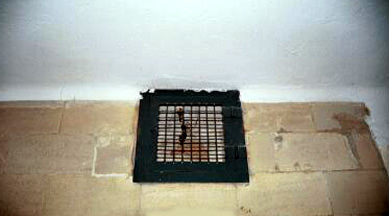 According to tour guide Gordon Hogan, poisonous capsules were poured into the Dachau gas chamber through two vents on the east wall of the room, as shown in the photo below. The vents shown in the photos above are on the opposite side of the room from the heater. Wouldn’t it have been more efficient to put the heater closer to where the pellets were poured in so that they would heat up faster? There are two serious problems with Gordon Hogan’s version of how poisonous capsules were put into the Dachau gas chamber disguised as a shower room. 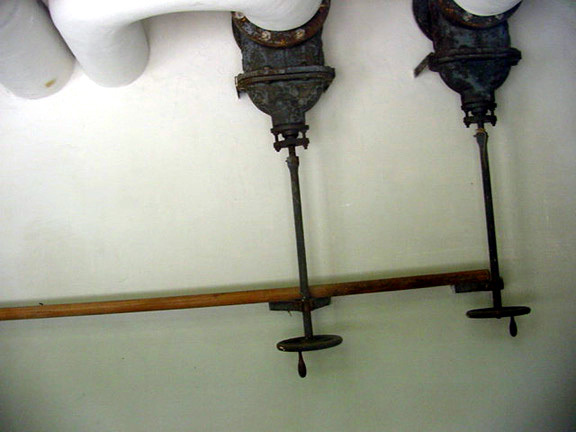 The first problem is that the American prosecutors at Nuremberg showed a film of the gas chamber in which it was explained that the gas came through the shower heads and the gas flow was regulated by control wheels behind the west wall of the gas chamber, as shown in the photo below. According to the evidence presented at Nuremberg, the poisonous gas was not in the form of capsules. Notice the peep hole in the photo above. The person who was operating the control wheels could look inside the gas chamber to see when all the prisoners were dead. There was no peep hole on the opposite wall where Gordon tells visitors that poisonous capsules were poured onto the floor. Shouldn’t the peep hole be on the side where the gas is being poured in? In the film that was shown at Nuremberg, the narrator said that poison gas was vented through empty light fixture boxes and that the input of the gas was regulated by push buttons which you can see in the black and white photo above. 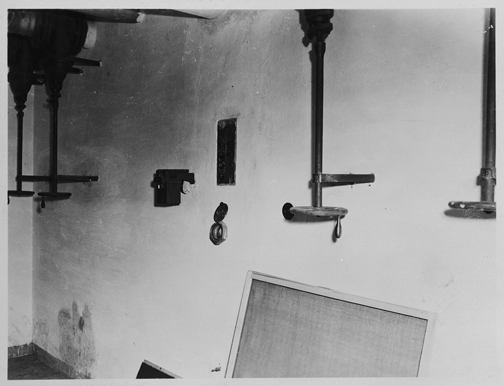 The photo above shows a light fixture box in the northeast corner of the Dachau gas chamber. Note the wiring for the light fixture that was removed. This box was described as a “gas vent” in the film, made on May 3, 1945, which was shown at the Nuremberg IMT on November 29, 1945. How come the American liberators didn’t notice the openings on the east wall where Gordon Hogan tells visitors that poisonous capsules were poured into the room? Why weren’t these openings mentioned at the Nuremberg IMT? Could it be that these openings weren’t there until much later? The film that was shown at Nuremberg, which includes the gas chamber footage, can be seen on YouTube. The second problem with Gordon’s version of the gassing procedure is that Dachau had four machines that were supplied by the Degesh company, which manufactured the poisonous pellets, but there was no Degesh machine in the gas chamber disguised as a shower room. The Degesh machines were installed in the four disinfection chambers where the clothing was deloused with Zyklon-B, the same gas that was used for homicidal gassing. These machines automatically opened a can of Zyklon-B pellets, poured them into a wire basket and then blew warm air over the pellets. After the clothing had been deloused, the pellets were retrieved from the basket, put back into the can and returned to the Degesh company to have more poison put into the pellets. In Gordon’s version of the story, the pellets would have gone down the six floor drains in the gas chamber and poisoned the whole camp. There were no floor drains in the disinfection chambers for this very reason. To me, the big question is why didn’t the Germans use one of these Degesh machines in the homicidal gas chamber where people were gassed at Dachau? 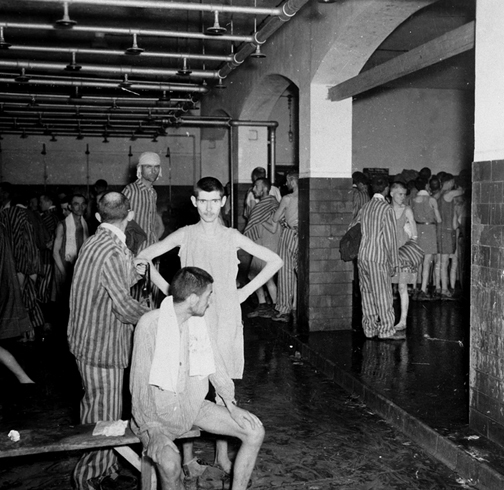 The official report seems to be saying that either water or gas could come out of the shower heads since “the routine was similar upon arrival of all internees.” However, the prisoners would not have been fooled; the photo below shows what a real shower room at Dachau looked like. This shower room is in the building that is now the Dachau Museum. The shower fixtures have been removed. The gas chamber, that was disguised as a shower room at Dachau, apparently did not have shower fixtures that looked like those in the photo above. When I visited in 2001, the one remaining shower head was just stuck into the ceiling. Sometime after the film was shown at Nuremberg, it was discovered that the shower heads were not connected to any pipes. But in the film, there were pipes shown behind the west wall of the gas chamber and those pipes entered the gas chamber disguised as a shower room. If you look through a window behind the gas chamber, you can see that the pipes shown in the Nuremberg film are still there. The photo below was taken through the window. If someone were to cut a hole in the 7.6 ft. dropped ceiling of the Dachau gas chamber, would we be able to see water pipes hanging from the real 10 ft. ceiling above? The two rooms on either side of the gas chamber both have 10 ft. ceilings. After a group of U.S. Congressmen visited Dachau on May 1, 1945, they wrote a report in which they described the ceiling of the gas chamber as being 10 ft. high. On May 3, 1945, when the film that was shown at Nuremberg was made, the ceiling was 7.6 ft. high. Curiously, no one was ever put on trial for a war crime involving the gas chamber at Dachau. Autopsies were conducted on hundreds of bodies at Dachau by Dr. Charles Larson, but no evidence of death by gassing was ever found. The Dachau Memorial Site leaves it up to the individual tour guides to tell visitors whatever they want to about the gas chamber at Dachau. Holocaust denial is against the law in Germany. But what about telling Holocaust lies? Shouldn’t there be a penalty for that also? I did a tour with Gordon Hogan in August 2012 and he told us about the “Dachau gas chamber”s being used and how they were used. He did this in the same way he is quoted above as doing. It sounded a little strange to me as even I, a casually interested person in WW2, thought I “knew” Dachau was not used to gas people. However when I asked why historians now think that a gas chamber at Dachau was used, he claims that witness statements claim it was which were never given proper weight in the past (apparently Gordon Hogan, historian extrodinairre, is the first person in history to realise this), and that’s good enough for him. He also claims that traces of Zyklon B have been tested for and found(!!). This all sounded a little “make it up as you go along” so I researched some more on the internet, and realise there is no evidence that any people were gassed at Dachau. Gordon should be careful about his propaganda. Maybe there should be checks done by Dachau authorities to make sure that only the truth is being talked about. I did the Dachau tour with Gordon and found him to be a truly knowledgable and empathetic host. Our small group had varied levels of knowledge and he did a wonderful job at educating us all. I think a critical flaw in this posting is that you seem to have forgotten that most people are less precise that yourself with the facts, and that these posts may not reflect anything said by Gordon. I would be sad if people opted for another tour guide due to your post, as really he was a remarkable man with such an understanding of the human psyche and the emotional journey that you undertake at Dachau. It was the guide who was the clever one. He apparently knows that Zyklon-B must be heated in order for the gas to be released, so he told these students that warm air was pumped into the room. But what he pointed out was a heater that was there to heat the room. The warm air was not blown over gas pellets through this heater. 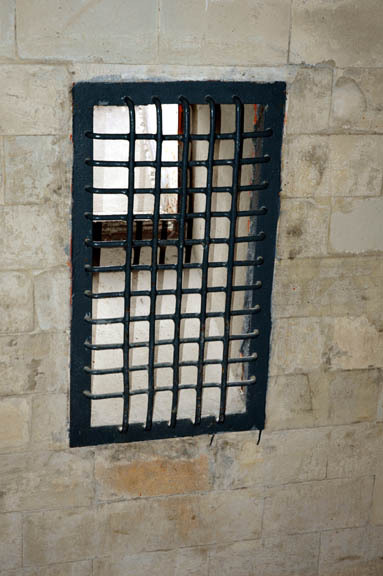 He told the students that the gas pellets were put into the room through two openings on the east wall. The openings were on the opposite side of the room from the heater. There is absolutely no proof that those openings were there when Dachau was a concentration camp. These openings were made several years later. In other words, he made up LIES to educate the students about how prisoners were gassed at Dachau. From 1965 to 2003, there was a sign in the Dachau gas chamber which said in five languages that it was never used or never put into operation. Did he tell you that? Did he give any evidence that was discovered after 2003 that the gas chamber was used? Gordon might be “truly knowledgable” but he apparently doesn’t know that gold is not used for “fillings.” Gold is used for crowns on teeth and for a gold tooth in a bridge between two teeth, but not to fill a cavity in a tooth. Was this person ethnic Irish or a citizen of Ireland? Was this person Irish-American? How was he or she killed and when? We need more information to identify him or her. Read my answer to Glenn Doogan regarding Patrick O’Leary who was from Belgium and was not Irish. I am trying to find out who was the only Irish prisoner in Dachau. If anyone can help me i would be greatful. Are you referring to Patrick O’Leary, who was a British SOE agent? He was from Belgium and his real name was Albert Guérisse. He adopted the name Patrick O’Leary as his code name when he was a British SOE agent in charge of the PAT line. He survived Dachau and was the president of the International Committee of Dachau when the camp was liberated. I work as a guide at Dachau & as far as I know the Irish prisoner`S name was Patrick O`Leary..
Isn’t it possible they use Dachau to ‘stand in’ for all the camps? Unless the person is an historian, they probably won’t visit more than one camp to get an idea what it’s all about. In that case wouldn’t using Dachau’s ‘room’, let’s call it, demonstrate how people were killed at the other camps? It would make sense to me, since if I visited Munich and Dachau, I probably wouldn’t also go take a bus to Polish camps. One visit would suffice for the enlightenment of some. Yes, I think you are right that Dachau is used to “stand” for all concentration camps. At the entrance to the Dachau Memorial site, there is a sign with a quote from Eugen Kogan, who wrote “The Theory and Practice of Hell.” Kogan was never a prisoner at Dachau, but he wrote something about Dachau standing for all the Nazi camps. 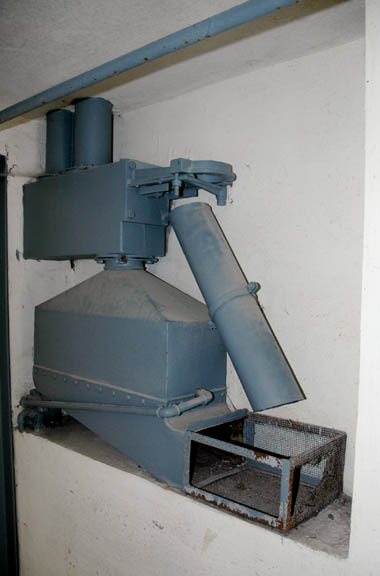 The “Dachau gas chamber” could be used to demonstrate how a gas chamber worked at other camps. The Zykon-B poison gas was in the form of pellets that could not go through the holes in a shower head, as the American prosecutors claimed at Nuremberg. The pellets had to be heated to a temperature of 78.3 degrees Fahrenheit in order to release the poison gas. Gordon Hogan tells tourists that the pellets were put into the Dachau gas chamber through two openings in the wall. However, there is no proof that these openings were there before the American liberators arrived. If the openings were there, why didn’t the prosecutors at Nuremberg mention them? Gordon also tells visitors that the pellets were heated to release the gas, but there was no way to heat the pellets, except with a heat vent that was a heater to heat the room, not the pellets. My complaint about Gordon Hogan is that he tells visitors that the Dachau “gas chamber” had everything necessary to gas prisoners, when it is very clear that it did not. Instead of telling visitors how the Dachau gas chamber worked, he should be telling them why the Dachau gas chamber could NOT have worked. Of course, if he did that, he would be thrown into prison in Germany for five years. So he should not mention any details about how the Dachau gas chamber worked, especially telling people details, which didn’t exist, at Dachau. I have written 177 posts to my blog since I started posting back in February, 2010. This post about Dachau tour guide Gordon Hogan has had the most hits, by far. It seems to have gone viral. Someone please explain to me why this particular post is so popular. When systematic extermination of the Jews began in 1942, the Jewish prisoners were transported from Dachau to the mass extermination camps in occupied Poland. In Dachau there were no mass extermination facilities. Also more than 8,000 inmates of the concentration camps Dachau and Mauthausen / Gusen were killed. I am familiar with all these web sites. The point that I was making in my post is that tour companies based in Munich bring groups of tourists to Dachau and they make sure that these paying customers get their money’s worth. Gordon Hogan is a little more knowledgeable than most people because he mentioned that the Dachau gas chamber had a way to heat the Zyklon-B pellets, so that the gas would be released faster. Little details like that make his lectures to the tourists more believable. Visitors on his “dark history” tours do not do hours of research to find out that what he told them is incorrect. The staff at the Memorial Site allows anyone to conduct a tour at Dachau and tell their customers anything they want to. These propaganda websites that you linked to, and the meaningless quotes/comments that are attached to them, do not tell us anything. Where is your own ability to say something about the actual issue that was raised here in the blogger’s article, which is about what took place at Dachau? You’re trying to get readers to go to these lying websites where they won’t learn the truth about Dachau, but you hope will get enmeshed in more Gordon Hogan type of exaggerations and nonsense about other camps. I think that Paul was trying to point out that even these well-known Holocaust web sites say that there was no gas chamber at Dachau or that the gas chamber was never used. From 1965, when the Dachau Memorial Site first opened, to 2003, the staff at Dachau was saying that the gas chamber was never used; now they allow anyone to bring a group of tourists to the camp and explain how the gas chamber worked, including adding the detail about the gas pellets being heated. There was a heating vent in the room, but this vent would have allowed the gas fumes to escape from the room. The vents on the outside wall are not air tight and the gas would also have escaped through them. Not to mention that the victims could have swept the gas pellets down the floor drains with their hands before they were heated enough to release the gas. The tourists don’t know all this, so they are at the mercy of the tour guides. I have waited to see what your homicidal-gas-chamber-believing readers would say to this, but it seems they can’t come up with anything. At least on this blog, they can’t get away with nonsense. The obvious fakery of the Dachau “gas chamber” is a real indictment against the way all the Holocaust Memorial Sites are handled. Your suggestion of the lowered ceiling with the water pipes for the showers hidden behind it is probably right. 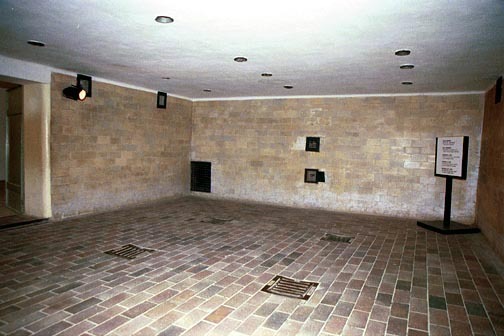 Shouldn’t one wonder why the homicidal “gas chamber” at Dachau is all tiled in ceramic, so clean and pristine, while the one shown at Auschwitz is just a grimy looking cellar? Both had identical classifications in the National Socialist concentration camp system. And your point is well taken: How can it be such an offense to write books and articles questioning details about the official version of The Holocaust, when tour guides hired at all the camp memorial/museums can say whatever the heck they want?! Oh, I get it … if you make it worse than it was, you’re on perfectly safe ground. The gas chamber at Dachau does not have ceramic tile on the walls. The walls are glazed brick, and the floor is also glazed brick. Look closely at the bricks in all the photos. When my bathroom was remodeled, all the openings were made first and then the tile was put around the openings. In the Dachau gas chamber, it looks like the bricks were put in first and then the openings on the east wall were cut. Notice that the light fixture box is flush with the ceiling and the brick work around it appears to be a botched job. It appears that the light fixture box was moved, perhaps because the ceiling was lowered. In the first photo, there are two openings in the center of the wall in the background. The top opening is for the peep hole and the bottom opening is for a water pipe. The frames around the two openings do not match. On the other side of the wall, the peep hole is a tiny round hole, but on the inside of the room, the peep hole is a large square box. Notice that the bricks around the peep hole do not match the rest of the bricks; the light is reflected differently on the bricks around the peep hole. The construction work in the gas chamber looks suspicious, to say the least. Yes, I was not being observant. Thank you for pointing out all the obvious repair-work around the windows and the light fixture box. Once people’s attention is drawn to things like this, they are obvious. Don’t you think that’s one of the reasons they allow guides like Gordon Hogan — because it distracts attention away from these very details they don’t want people to notice? Same reason Paolosilv posts his other websites as if they are going to answer the questions that are raised here. They don’t. Sorry, paolosilv, I don’t mean to be picking on you, but your intention is not to clarify and get to the truth. Why don’t you say what you think this room was for?